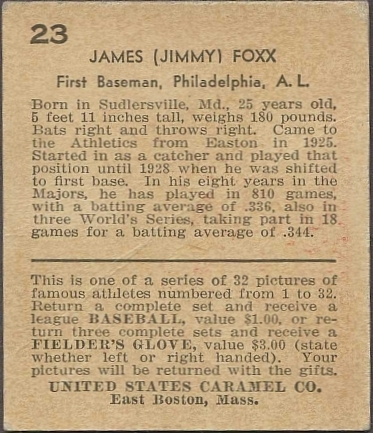 One of the rarest sets from the 1930's is the 1933 U.S. Caramel (R328) card sets. Nearly impossible to complete due to the #16 Charles Lindstrom card, there are 32 cards in the set, which includes boxers, baseball players, and golfers. Some of the most notable athletes in this set are Roger Hornsby, Ty Cobb, Jack Dempsey, Jimmie Foxx, Lou Gehrig, and Babe Ruth. The U.S. Caramel Company was located in Boston and was one of the last companies to produce a caramel card set. Bubble gum was quickly becoming more popular and the success of the Goudey gum cards released that same year would quickly overtake caramel and tobacco cards. 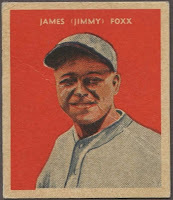 The cards feature a distinctive red background on the front and, on the back, a short athlete biography, including stats, and a short redemption offer. These cards can be easily identified by the phrase "United States Caramel Co., East Boston, Mass." Currently, we have a #23 Jimmie Foxx in stock. 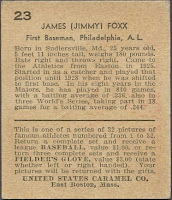 Please click here to view our entire selection of 1933 U.S. Caramel Cards.